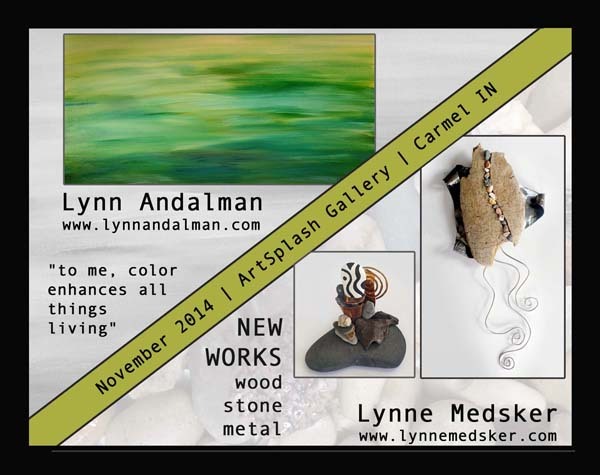 I’m excited to be sharing the main gallery space at ArtSplash Gallery in Carmel, Indiana, during the month of November with the talented Lynn Andalman! We’re jokingly calling it the Lynn & Lynne show. 🙂 I’ve been busy creating new work with a focus on wood, stone & metal. It’s more sculptural than some of my previous work and I’ve been having a lot of fun exploring the shapes, textures and colors I’ve been using. We’ll have some delicious treats and libations to celebrate the show during the Private Opening, Friday, November 7th, 2014 from 6 – 9 p.m. If you can’t make it then be sure to attend the Public Opening/Monthly Gallery Walk, Saturday, November 8th, 2014 from 5 – 9 p.m. Of course you can always visit during normal gallery hours as well. ArtSplash is located at 111 W. Main Street, Suite #140, Carmel, IN 46032.